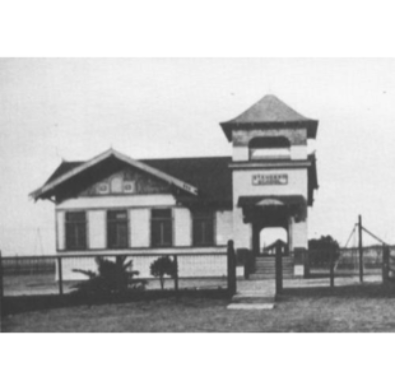 The Standard School District was formed in 1909 from territory in the Beardsley and Aztec School Districts with twenty-seven students and one teacher. Standard Oil Company donated five acres of land for the new school. The original school building was located about one-half mile east of Chester Avenue on the north side of Oil Center Road, later re-named China Grade Loop. A second building was constructed in 1911 as a music room and soon became the primary building. By 1916 the population had settled farther south in the area just north of the Beardsley Canal. This settlement, with the registered name of Oildale, boasted a post office, drugstore, a number of grocery stores, a dry goods store, a church, a livery stable, and three roadhouses. In 1918 there was a vote of the people and five acres of land were purchased from the Pacific Oil Company. The school was literally moved down from the old site, which then reverted to the Standard Oil Company. The new location was bounded on the west by North Chester and on the south by Ferguson Avenue. The original and the second buildings were moved to the new school site. Over the years many new buildings were added to the school on North Chester. In 1935 the district began making plans for construction of a new auditorium. Under the administration of Franklin D. Roosevelt, federal funds were available for a P.W.A. project for the building. The district also contributed funds for the building. The auditorium, which seats about 850, was completed in the fall of 1937. To this date, it remains an important part of life in Kern County. Standard Elementary School on Minner Avenue was opened in the late 1940's with seven new classrooms added in 1951. In 1954 Highland Elementary School opened and Wingland Elementary School opened in 1957. All schools in the Standard School District were upgraded and remodeled during the 1990's. The original building had to be demolished due to safety regulations and code requirements. The second building was moved to the Kern County museum. The community has benefited from those who have worked and volunteered in the district. Because of the ideas and hard work of community members, the district has provided, and will continue to provide, educational excellence to many students. The second building, which is now located at the Kern County Museum. Today, the Standard School District has a student population of approximately 2,900 and encompasses an area of approximately 34 square miles. The district has three K-5 elementary schools and one 6-8-grade middle school in the North of the River area of metropolitan Bakersfield. The schools in the Standard School District are modern, functional facilities that are equipped with computers and other multimedia, and are staffed with excellent teachers and support staff. The mission of the district is to prepare students for the future by developing each student's positive self-concept and to prepare each student to become a thinking, contributing, responsible member of a rapidly changing society. The rich traditions of the past and the dedication of the people of the community and the people who work in the district will make this happen. Preparing students to reach academic success and become thinking, contributing, responsible members of a rapidly changing society.